Here’s my game story and game thread – plus a slideshow. 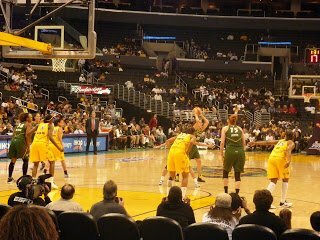 It was notable that both Storm Coach Brian Agler and Lauren Jackson had an opportunity to comment on what a big deal it was for them to finally beat LA in the post-season, but neither did. Svetlana Abrosimova passes the ball, and passes it fast, in the first quarter. Lauren Jackson did miss a few shots today, and this was one of them. 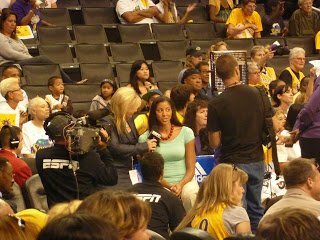 ESPN interviews Candace Parker at a timeout. 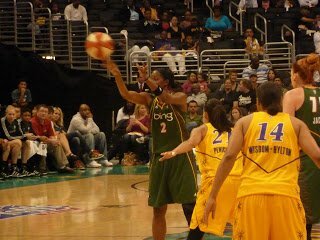 Swin Cash passes in the second quarter. 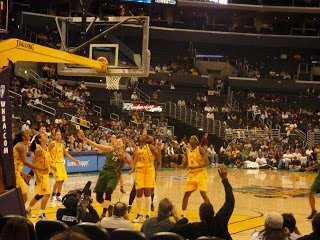 Sue Bird battles for the ball, and wins. 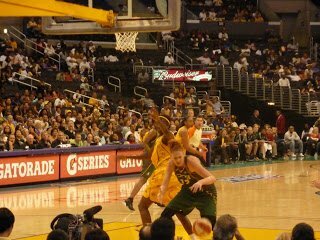 The Storm outrebounded the Sparks 34-27, including this one by Lauren Jackson. 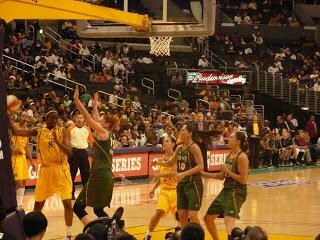 Delisha Milton-Jones vs. Lauren Jackson. 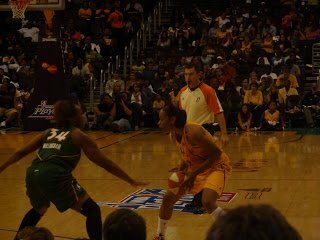 Le’Coe Willingham vs. Tina Thompson. The Storm’s take on it. The Sparks don’t have a recap posted yet. Phoenix also took their Western Conference semifinal in two games, sweeping San Antonio today. No surprise in either case, but I hope the conference finals are a good series.